George North could play a part for Saints against Harlequins at Twickenham on Saturday - if he comes through training unscathed. The Wales star has been sidelined since suffering a knee injury during the Champions Cup defeat to Saracens in October. He was due to return in one of the recent matches against Ospreys, but suffered a setback. North has been back on the paddock but Saints will continue to monitor him ahead of the final fixture of 2017. "George North has trained so we'll see how he gets through the week's training," said interim head coach Alan Dickens. "He did have a bit of a setback. "He did train and pulled up, which put him back a week or two. "Any team would miss George North. "When George North is at the top of his game, there aren't many wingers in the world who are as good as him. "At the beginning of the season, George was outstanding, he was scoring tries, he was getting a lot of the ball, working well off his wing and he has been a miss. "Wales have missed him as well and he's a quality player." 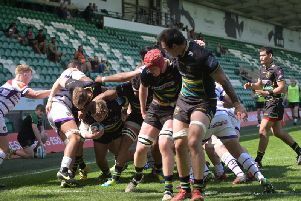 Saints were also without Stephen Myler (calf), Tom Collins (foot) and Kieran Brookes (hand) for last Saturday's 35-14 defeat to Exeter Chiefs at Franklin's Gardens. But Dickens said: "Stephen Myler has returned to training and Kieran Brookes is not too far off. "Tom Collins has been in a boot for the past couple of weeks due to a foot injury, but he's pretty close." Alex Waller remains sidelined after suffering a broken arm in the clash with Newcastle Falcons at the start of December.